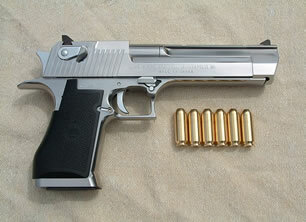 Desert Eagle is a Semi-Automatic Pistol made both in US & Israel. It is available in 3 different Calibers 9mm, 11.1mm and 12.7mm. Its feed systems range from 7 rounds up to 9 rounds. It has a number of Variants including Mark I (no longer in production), Mark VII, Mark XIX & the Baby Jericho. A number of great traits under its belt, i.e. good firing accuracy, long effective fire range, and powerful cartridges, make Desert Eagle an ideal pistol for sport shooting and hunting. With great reviews all around many people jump at the chance to own one. Desert Eagle might be available for customers across Canada once we become a store.